A recent study, affiliated with UNIST has presented a new cost-efficient way to produce inorganic-organic hybrid perovskite solar cells (PSCs) which sets a new world-record efficiency performance, in particular photostability. The research team envisions that this method and platform will significantly contribute to accelerate the commercialization of PCSs. 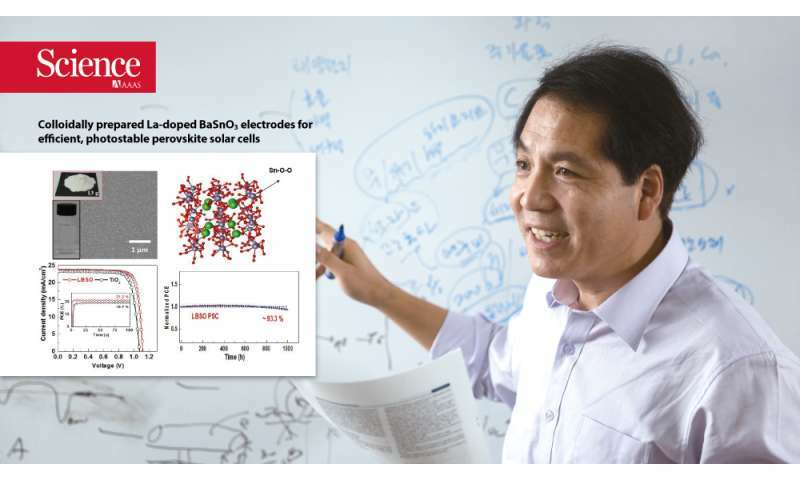 This breakthrough comes from a research, conducted by Distinguished Professor Sang-Il Seok of Energy and Chemical Engineering at UNIST in collaboration with Dr. Seong Sik Shin and Dr. Jun Hong Noh of Korea Research Institute of Chemical Technology (KRICT). Their results, published online in the March issue of the prestigious journal Science, has emerged as the most promising candidate for the next generation high efficiency solar cell technology. PSCs are made of a mixture of organic molecules and inorganic elements within a single crystalline structure, that together capture light and convert it into electricity. It is an unique crystal structures, consisting of two cations and one anion. They can be fabricated easily and cheaply than silicon-based solar cells, and on a flexible and rigid substrate. Moreover, PSCs reaching a photovoltaic efficiency of 22.1%, comparable to that of single crystalline silicon solar cells (25%), have been attracted much attention as the next-generation solar cells. Wonderful, but I'd like to see perovskites made without lead. "Westinghouse bankruptcy could grind US nuclear sector to a halt"